I'm always looking for new ways to read about history in my household. So when Golden Prairie Press came up as a vendor for the Schoolhouse Review Crew, I knew immediately that I wanted to get a look at the book Uncover Exciting History. Golden Prairie Press started when Amy Puetz, a homeschool graduate, decided to write a book about historical costumes. She went on to write additional history books. 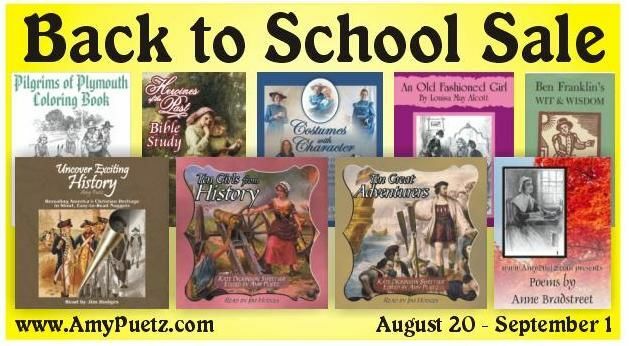 The Schoolhouse Review Crew had the chance to review four different titles, but in my male-dominated household, titles like Heroines of the Past Bible Study did not stand a chance. 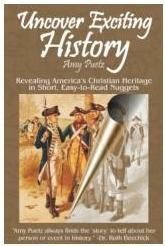 We went for Uncover Exciting History: Revealing America's Christian Heritage in Short, Easy-to-Read Nuggets. At 184 pages, the book contains 25 chapters on U.S. history, plus four bonus chapters. That means roughly six pages per chapter -- so it truly is in short nuggets. We received the ebook (it is also available in physical form and as an audiobook) and were easily able to send it to my Kindle. The formatting has been perfect, though as it is not a Kindle book per se, it isn't straightforward to navigate. But since we are just reading it straight through, it has been fine. I have to confess right off the top that the "Revealing America's Christian Heritage" part of the subtitle made me nervous. While I do believe that America has a Christian heritage, and I do believe that Christianity played a far-too-often-forgotten role in the foundation of this country, I also think most homeschool publishers who bandy about the "Christian heritage" phraseology are far too over the top with it. My expectation for this book was that we could read some great stories, but that we'd be stopping frequently to discuss whether the claims about Christianity's role were accurate. I was wrong. Oh, I was right about the great stories aspect. It was the rest of it that I guessed wrong about. There is certainly some mention of God providing or protecting, like in the fourth chapter Squanto is said to have been sent by God to help the Pilgrims. But I find it is hard to read about Squanto and not think that God sent him. Some of my more secular readers will disagree. So what does the book cover? The book goes through a more-or-less standard set of events -- Columbus, first settlers, the American Revolution and the Constitution, westward expansion, the Civil War, World War I, the Depression, finally ending with a chapter on the Navajo Code Talkers in World War II. There are chapters on all kinds of other events that aren't included in many short history books. These include the Great Awakening, the French and Indian War, the Barbary Coast Wars, the Second Great Awakening, and the Mexican War. Intended for ages 12 and up, we decided to use this as a read-aloud for my three oldest (ages 15, 13 and 11), and the 8-year-old always listens in too. My 6-year-old daughter kind of floats in and out, but her big brothers listen intently. Well, no. Not entirely true. Connor, the oldest, tends to tune out in chapters like the one on the Pilgrims. "Mom, I have read all of this a hundred times!" Fortunately, there have only been two or three chapters like that. Most of the book either covers events he really doesn't know at all, or it covers events from a slightly different perspective. After each reading (which takes us roughly ten minutes), there are questions and activities in the book to expand on the learning. In the chapter on the Spanish-American War, for instance, there are two basic comprehension types of questions. There is a link suggested to go read an original document. There are two book suggestions, one for younger children, one for high school students. And there is a geography assignment. Let's look at the first chapter, the one on Columbus. What I appreciated is that this man is written as a real person. For example, "Although Columbus was an amazing explorer, he was a very poor governor and was completely incapable of keeping his men in order." I appreciated that Columbus was portrayed as a flawed man, neither completely evil, nor perfectly wonderful. We are enjoying this book. The boys think the best part is the stories about people they didn't know (or only vaguely knew) before. I love that we have a relatively short read-aloud that I can use with everyone. My bottom line: These history stories avoid being politically correct, yet don't err on the side of Christianizing everything. Each story gives enough real detail (with quotes and excerpts from the time) to be informative, even in rather short chapters. Additional resources are suggested as well. Overall, there is a good mix of the familiar and unfamiliar parts of US history. We love it. Right now, Amy has a back to school sale going, so this book is currently available for $11.96 as an ebook, or $15.16 for a physical copy. I want to purchase Ten Great Adventurers while it is on sale!